Give your kitty the high-protein nutrition he needs to thrive with Dave's Pet Food Naturally Healthy Grain-Free Shredded Salmon Dinner in Gravy Canned Cat Food. Purr-fect for salmon lovers, it provides plenty of protein to fuel all those adventures, with fish broth and salmon as the top ingredients. Every juicy bite is loaded with wholesome omegas for a lustrous coat, plus vitamins, minerals and essential taurine to help your pal look and feel his best. With no grains, wheat, gluten or anything artificial, even kitties with sensitivities can dive into their bowl. Grain-free wet food is made with fish broth and salmon as the top ingredients for animal sourced protein to support healthy muscles. 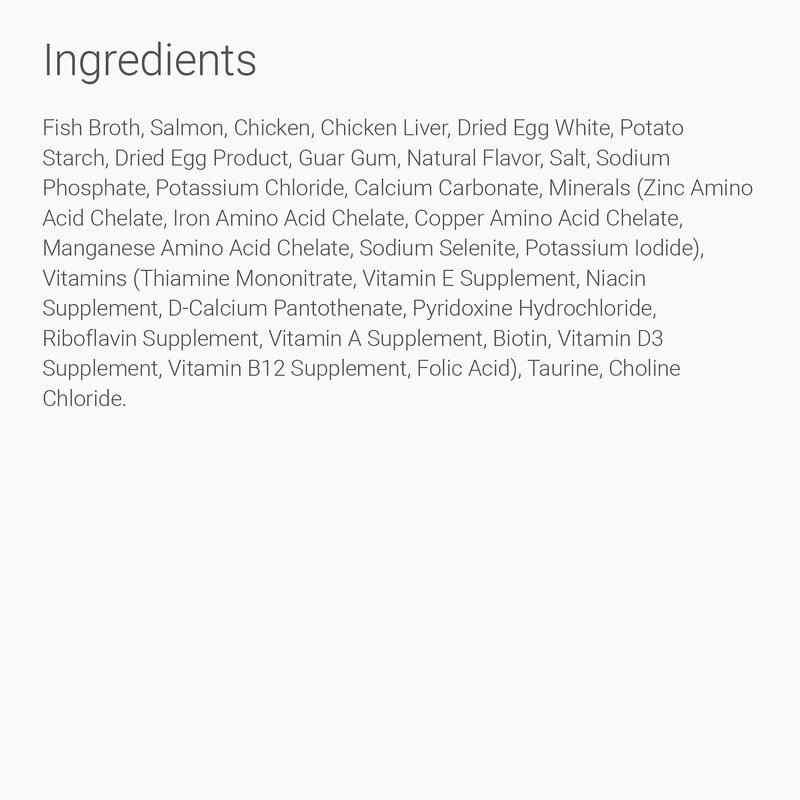 Fish Broth, Salmon, Chicken, Chicken Liver, Dried Egg White, Potato Starch, Dried Egg Product, Guar Gum, Natural Flavor, Salt, Sodium Phosphate, Potassium Chloride, Calcium Carbonate, Minerals (Zinc Amino Acid Chelate, Iron Amino Acid Chelate, Copper Amino Acid Chelate, Manganese Amino Acid Chelate, Sodium Selenite, Potassium Iodide), Vitamins (Thiamine Mononitrate, Vitamin E Supplement, Niacin Supplement, D-Calcium Pantothenate, Pyridoxine Hydrochloride, Riboflavin Supplement, Vitamin A Supplement, Biotin, Vitamin D3 Supplement, Vitamin B12 Supplement, Folic Acid), Taurine, Choline Chloride. 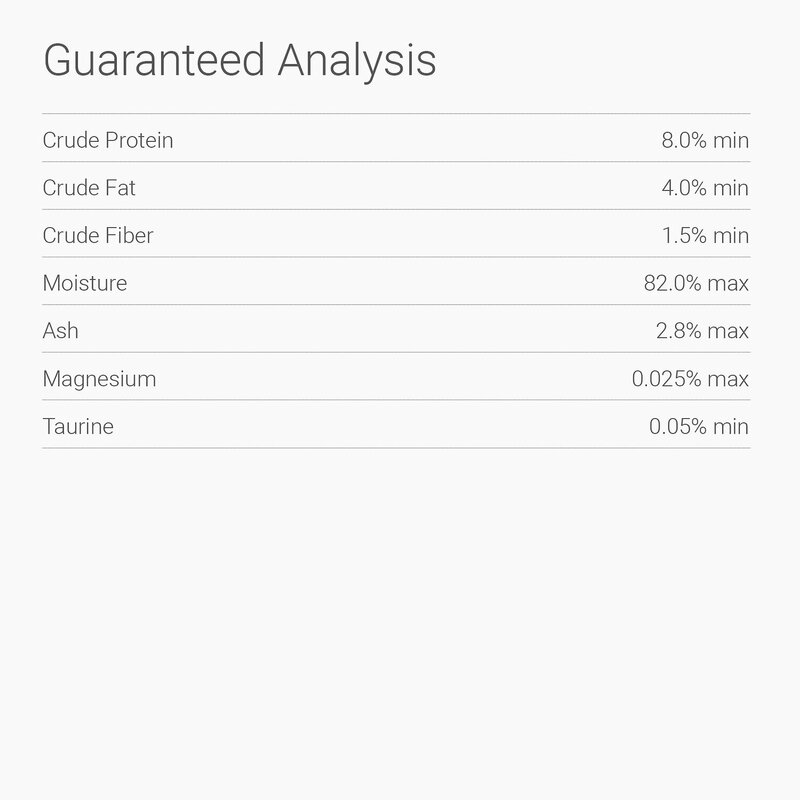 Feed according to the age, size, and activity of your cat. Feed at room temperature. Your cat should always have access to clean fresh water. (5.5 oz) Adult: Feed 1 1/2 cans per 7 lbs of body weight per day. Great product but finicky cat. I purchased this thinking that my cat would love it. But, oh boy!, I was totally wrong. She used to have the chicken formula for an 3 years but she changed her mind and she doesn't eat it unless it is tuna which I personally don't like the smell. In overall, I highly recommend it. Just be sure to buy a few can b4 you commit to buy 24 cans that the cat won't eat. Highly nutritional, no fillers, low phosphorus, and reasonably priced!! Wanted my cats to eat new food!! The ingredients sounds good .. when I opened first can I didn't like the smell, but I thought it is fish, so I gave it to the kitties to eat. They ate first time- I was happy( they are picky ).. But next time they left almost all of it in their dishes.. I added food their definitely like , so they can get used to the new one . But see less and less willingness to eat it .. I couldn't order one-two cans to try. Now I have whole package, I think they won't eat!! Will have to donate this food. 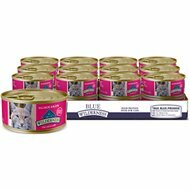 Best food for the best price and the cats love it, I've turned a lot of people onto Dave's pet food and all their animals won't touch any other food now. Shortly after I had received it, I gave some to my cat, Fluffy, and she just smelled it, but wouldn't eat it. She liked Salmon, but for some reason, she wouldn't eat this canned cat food. I don't plan to re-order this for Fluffy. THEY LIKE THE SALMON BUT NOT AS MUCH AS THE REST OF DAVE'S WET GRAY DINNERS.